The Motor Chase, sheet music from the vintage era. Homepage. This page: Sheet music featuring a vintage motorcar chase piano solo on it's cover. The Motor Chase, by Hermann Schmitt. A quick look at the automobilia collecting section shows that a motor-themed collection can start with the most obscure of objects. Music and the motor-car go right back to when the internal combustion engine was first strapped into a simple chassis. Many car manufacturers produced catchy tunes advertising their latest models, and a number of artists wrote and performed songs about the motor-car, some of which made it onto 33, 45 and 78 rpm records for the public to play on their own gramophones at home. Some engine sounds and race commentaries also found their way onto vinyl record. If, of an evening, the mood took you to tinkle the ivories on your piano and have a family sing-song, you could work your way through a huge variety of musical scores, some relating to the automobile. I've a couple of examples of sheet music that relate to the car, one of which is shown below (the other I have is so spectacularly "politically incorrect" I'd be lynched by the easily-upset brigade if I showed it here!!). 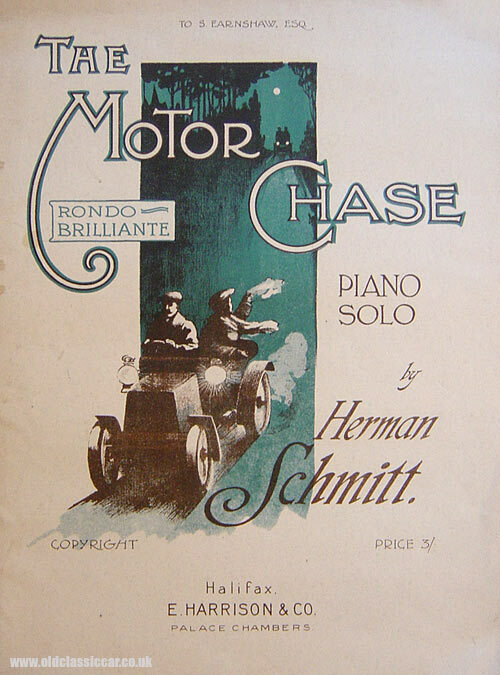 This two page piece of sheet music features an illustration for Hermann Schmitt's "The Motor Chase" piano solo on the front cover, although curiously the instructions given inside are for different tunes altogether. It was priced at 3/- (three shillings), and shows a veteran car, with two people on board, being hotly pursued by two shadowy figures in another veteran machine, their lights blazing before them. This publication is undated, although one of the tunes inside is copyrighted 1916, and the cars shown on the front cover are of a veteran style, which suggests that this was printed around the time of the Great War. Return to the car collectables section, here at oldclassiccar.